Girls' Career Institute (GCI) offers a "mini college experience" at Douglass Residential College on the campus of Rutgers University. Delegates experience a sample of college life by living in a dorm, eating in a cafeteria, and attending lectures and workshops. 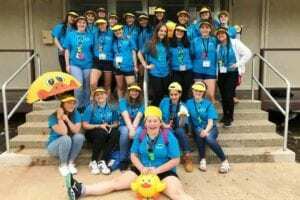 They learn about career choices from volunteer professional speakers and how to network with other delegates from all over the state of New Jersey. Many establish lasting friendships with one another. Delegates are sponsored and the cost is underwritten by a local NJSFWC club. Delegates are selected on the basis of interest, community service and participation in school activities. 2019 Forms are NOW AVAILABLE in the Materials section for clubs.